Parkinson’s disease is a disorder of the central nervous system that affects movement. Certain Nerve cells called as Neurons are present in the Brain. These neurons are responsible for the production of the dopamine (a natural chemical). Dopamine passes messages to another area of your brain when you want to move. In Parkinson’s disease, the cells that make the chemical dopamine starts to die or damage. Thus the level of dopamine decreases. When level decreases too much, you can’t control your movements and this is what called for Parkinson’s disease. Cabergoline belongs to the class of the medication called as dopamine receptor agonists. The drug stimulates dopamine D2 receptor. Dopamine plays an important role to help the body movements. Lack of dopamine and reduction of the nerve cells makes people shaky and weak. This creates a problem in movement and control over their bodies. They cause nerve messages to the muscles to become slowed and abnormal. Cabergoline stimulates the release of dopamine. This helps to ease the symptoms of Parkinson’s disease. 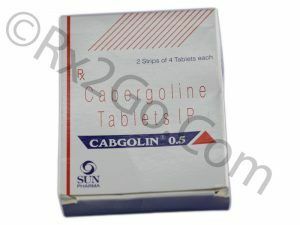 Cabergoline is available in the form of oral tablets of strengths 0.25 mg and 0.5 mg. The dosage depends on the reason you are taking it. Adult dosage– 0.25 two times in a week. The dose is increased by 0.25 mg depending on the level of prolactin. Maximum dose- 1 mg two times in a week. Children- safety and efficacy not established. Swallow the tablet with a glass of water at a mealtime. Take the tablet around the same time every day. Stepwise increase in dose will help to reduce the side effects. Reduce the amount of prolactin that is released from the pituitary gland. Treats hormonal imbalance (too much prolactin in the blood). Helps to stop unwanted breast milk production. Helpful in treatment of turners of pituitary glands. Used as Immuno-therapy for Parkinson’s disease in the early phase. Combination therapy- The drug is used in combination with other drugs in progressive- phase of the disease. What are the precautions in taking Cabergoline? Inform your doctor about all other medications you take. Confirm its use in pregnancy and breastfeeding. Be cautious while you get out of bed, or do some work which needs to be alert e.g. driving. The drug may make you feel dizzy or draws. Inform your doctor about any abnormal behavioral changes. Generic drugs are cheaper than brand drugs. They contain same active ingredient. But brand drugs include huge charges spend on research and development of the product. They also spend on advertising, pricing and marketing of product. Generic medicines don’t include this expenditures. Pack of 32 tablets of 0.25 mg – $ 86, per unit cost of 0.25 mg is $ 2.69. Cost of 32 pills of 0.5 mg – $ 238.51, per unit cost of 0.5 mg – $ 7.45.